It is time to redo my 72-hour Food Kits. It isn’t my favorite chore of the year, but I do like knowing I have enough food and water to last if a natural disaster happens. Bug-out-bags or 72-hour kits are designed to keep you alive for 72 hours in a disaster situation. This is usually long enough for emergency crews to reach you or for you to self-rescue. My husband, Aaron and I are campers and hikers, so my food kits are designed with a hiking mindset. In my opinion, the best 72-hour food for emergencies is lightweight, compact and easily prepared. My 72 Hour Kit Menus are built for function, weight and high calories. I’m willing to sacrifice a little bit of taste for weight. I know that some people are a bit more into food than me, so I’ve put together a list of the basic emergency food I use and then added a secondary list of item you can add for your individual palate. I’ve linked everything to Amazon so you can see the items I’m referring too. The pricing seemed pretty decent on Amazon, but if you are patient and watch your local grocery stories I bet you can save even more money. You can also use the Ibotta app to save a bit of extra money. As I mentioned before, I’m all about simplicity. However, in a true disaster having warm food can be a huge comfort factor. For this reason, I have also included a list of warm food you can add to your emergency kit if you have a heat source. You can read about heat sources in my post on the non-food portion of my bug out bag packing list. Just remember when you do your planning that typically warm food requires additional water. Water weights a lot. I’d rather be drinking my water then using it for food preparation. Every couple of months I do a massive shopping trip and buy all of my camping and 72-hour kit food. I take a few hours and put together 20-30 one-day food kits that we can grab anytime we are heading out. We put some of these food packs in our 72-hour kits and the rest are used over the next couple of months when we go on our crazy adventures. 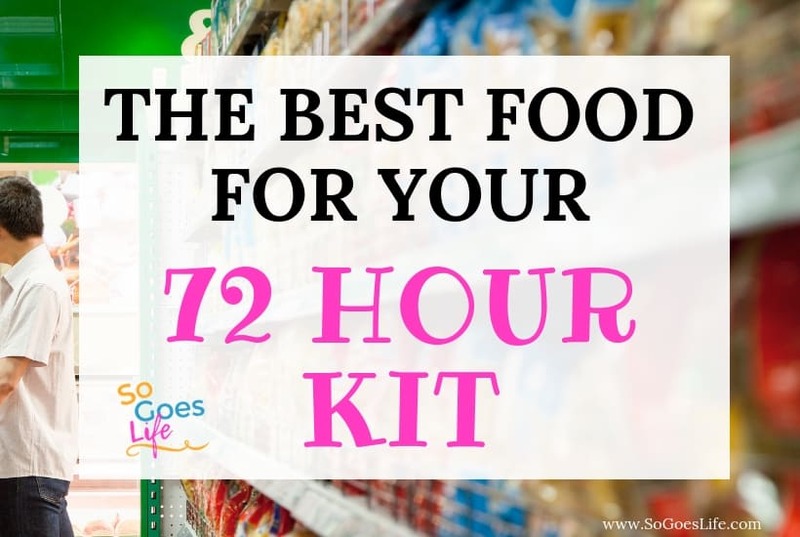 Each 72-hour food kit has enough food to last me for one day at a minimum. Based on the trip I’ll add a few extras, but for the most part, my emergency food packs are grab and go. It is a great way of rotating our food. Even if you don’t backpack, if you plan your food kits correctly, you can use them for sporting activities, kids activities, and general travel. You may want to switch up the mix slightly, but it is good to test out your food choices and make sure your kids will actually eat the food in your emergency kits. I recommend rotating the food in your 72-hour kit on a semi-annual basis. I do a mix of bars and protein for quick and easy breakfasts in an emergency situation. Belvita Breakfast Variety Pack – I typically add 1-2 package which includes 4 crackers for each day. The Belvita’s are great because even if they get tossed around they are still easy to eat and don’t get mushy like a lot of breakfast bars. Nutri-Grain-Kellogg’s Cereal Bars Variety Pack – I usually add 2-3 of these to each package. They tend to get mushy after a while, so they need to be rotated frequently. There are a ton of breakfast bar options available. Try out a few kinds and use the one that tastes best. Carnation Breakfast Essentials, Rich Milk Chocolate Powder – The Carnation doesn’t taste great with water, but when you are in a rush it is a quick way to sneak in some protein and vitamins. You could also include pretty much any protein shake. Dry Granola – Pretty much any granola can be eaten dry and is a great source of protein, calories, and fiber. Quaker Instant Oatmeal Packets Variety Pack – Gotta love the old stand-by of Oatmeal. It is quick and easy and fills you up. Personally, I recommend the flavor packs. There is nothing worse than bland oatmeal. I also recommend at least two packages per person for each meal. I also like mixing a regular oatmeal pack with some of the steel cut oatmeal packets. When I’m at home, I also add flax seed and chia seed. Natural High Strawberry Granola with Milk – This is a freeze dried meal. There are a ton of freeze-dried options that while slightly more expensive taste amazing. This is one of my personal breakfast favorites. Remember that the last three meal options need water, so plan accordingly. As previously mentioned, I’m a minimalist, so I typically eat a few protein bars and then plan on a larger dinner. If you don’t have a heat source you’ll need to do something similar. Below are a few links to some of the bars I currently like (I have to switch them up frequently since I hate protein bars with a passion). I also tend to snack periodically throughout the day and will include a list of snacks which makes a smaller lunch possible. If you need a more substantial lunch menu, add in some of the dinner ideas below. If I’m roughing it and don’t have a heat source I typically purchase the chicken and tuna salad kits. One is usually enough for me, but I’ve seen my husband go through 3-4 of them after a really physically demanding day, so plan accordingly. I’ll sometimes grab the standard tuna packs and then bring crackers and make my own kits. I personally hate the summer sausage, but most of my hiking friends swear by them. If you have a heat source your options are significantly better. Freeze dried food has improved significantly over the last 10 years and most of the stuff available is actually pretty decent. If you haven’t used freeze-dried food, they come in individual pouches with a zip-lock seal. You open, mix and then pour boiling water into the pouch for the specified time. They are super easy and surprisingly good. However, they are expensive and bulky. There is a variety of option, but I recommend purchasing one of the assorted kits so that you try a few kinds and see what you prefer. Here is a link to a Mountain House Assorted Bucket, but there are plenty of other brands that offer similar foods. Freeze dried foods tend to be expensive. Below are a few inexpensive dinner ideas for your 72 hour kits. Maruchan Instant Lunch Chicken Flavored Noodle Bowls – Personally I don’t like these, but Aaron and the girls love them, so they have become my go-to camping food since all they require is boiling water. Pasta Roni Cups – Although the directions call for microwaving, I’ve added boiling water to these a few times and they taste great. I prefer the Pasta, but the Rice a Roni cups work with heated water as well. ***Editors note: I’ve tried a variety of add water and microwave mixes now and so far all of them have worked when you add boiling water. I still recommend trying them first, but it means some of the more gourmet type meals work. I’ve tried the following brands: Zatarians; Annies and Minsley. Just remember to give the water about 10 minutes before opening the package. Also, I always put something heavy over the lid to keep the heat sealed in. If you have a pot for heating food than chili, ravioli or pretty much any canned food works well. Just make sure you include a can opener. Personally, I avoid these type of foods since they require extra cooking/dishes and they are very heavy. I recommend a variety of snacks with a mix of protein-based and sugar based products. Planters Nut – Nuts need to be rotated frequently, but are a great source of protein. Pretty much any trail mix will work (I love the ones that Costco sells). Nabisco Mini Snack Variety Pack – This is typically my form of sugar. My kids also really like Rice Kristy treats. Ritz Crackers with Peanut Butter – Anything that is cracker based also needs to be rotated frequently. They also tend to get pulverized, but they still taste decent. The little squeeze packs of Almond Butter are great for a quick shot of energy. I love fruit based snacks and tend to include Fruit cups, applesauce, fruit snacks, and fruit leather. I also dry my own fruit and often include dried apricots, bananas, and pineapple. Check out my post on How to Make Raspberry Fruit Leather or How to Dehydrate Apricots. I typically include granola bars as well. Most of the bars are just glorified candy bars, but they are quick and easy to eat and if you watch the content you can typically find some slightly healthier varieties. There are also a variety of high energy performance foods that include Gu, energy chews and sports beans. I try and always include at least a shot of Gu in each of my kits. You never know when you’ll need that extra little bit of energy. I also include some form of drink flavoring preferably one that includes electrolytes. I’ve used the Sqwincher ones, but know there are tons of options for drink supplements. You need a minimum of 1 gallon of water per person per day for drinking, food preparation, and sanitation. One gallon of water is 8 pounds, so plan accordingly. One of the reasons, I like having my 72-hour kit in a hiking backpack is because I can easily store 2-3 liters of water in my bladder. The rest of my water goes into Nalgene bottles. I live in Phoenix, so water is the most important thing in my pack. Nalgene bottles are virtually indestructible. Another option is emergency water pouches. They are rated to last 5 years and do not require rotation. They are expensive, but for emergency use would be incredibly handy. Based on the food you choose make sure you include extra water for cooking, utensils as needed (I like Sporks personally) and a can opener. My goal is always to keep my packs light and compact. 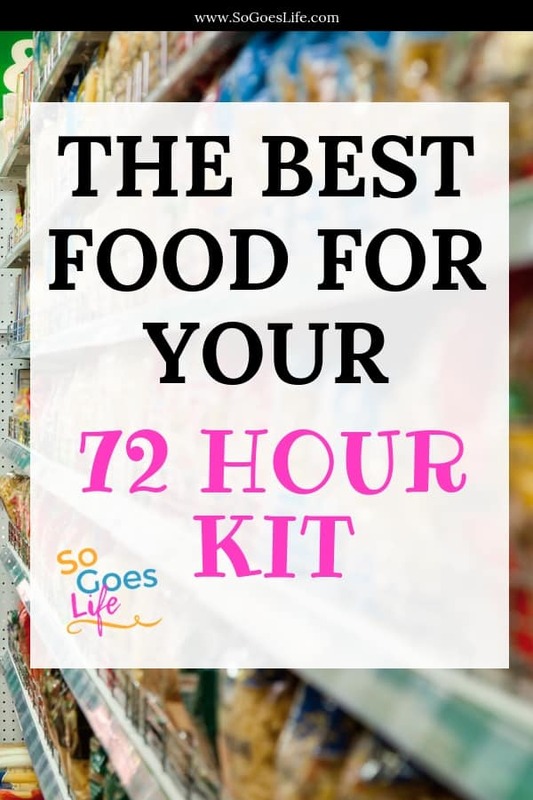 A 72-hour food kit is designed purely to help you survive long enough to either get to safety or to ensure you can survive an emergency until help gets to you. Don’t go crazy with our food options – you can survive a few days without a gourmet meal. This list is not inclusive and you will need to adjust depending on dietary, allergy and age restrictions. This is intended as a basic starter list that can be expanded based on your individual family needs. Having a premade 72-Hour Kit is a great starting point, but most of the premade kits are pretty basic. If you do go this route, don’t order the kit and then stick it in the closet. Review the items carefully and supplement as needed. I tried one of the National Geographic pasta dishes on a camping trip and it wasn’t amazing. I’m sure their food has gotten better since then, but you may want to get a single serving meal prior to purchasing a kit. I’m always looking for additional food ideas, so if you have any great ideas please include a comment below. I’m kind of sick of eating the same food over and over again on my camping trips, but hey the food above works. They are lightweight, give me plenty of calories and are easy to prepare and pack.